User Created Accordion With Fields? When a user is creating a node, is it possible to auto generate an accordion based on a field group or field collection? 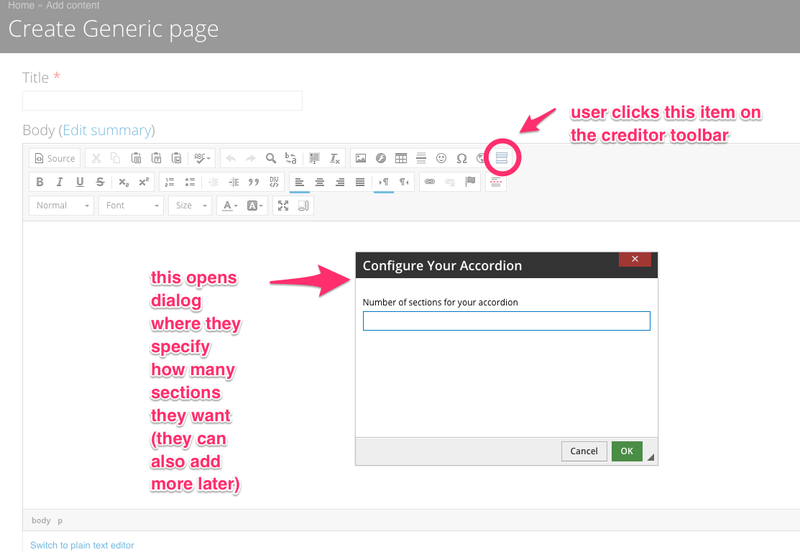 I want the user to enter the title(clickable to expand and show body) and body of their accordion(s). I see field_group and bootstrap_field_group, but both require me to add the title for example and then give the body of the accordion based on another field... That is admin specific. I'd like to give the user the flexibility to create their own title for each accordion item. The best way I have found to do this was to use Paragraphs. 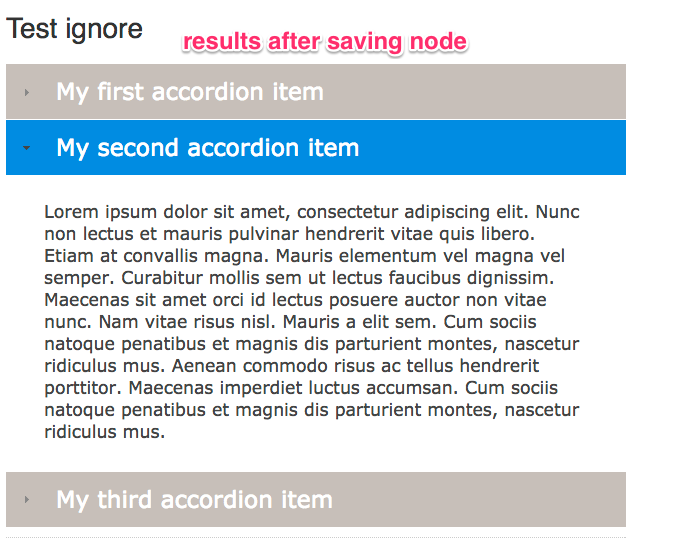 You can create an Accordion paragraph type, and an Accordion Item paragraph type. The Accordion holds Accordion Items. 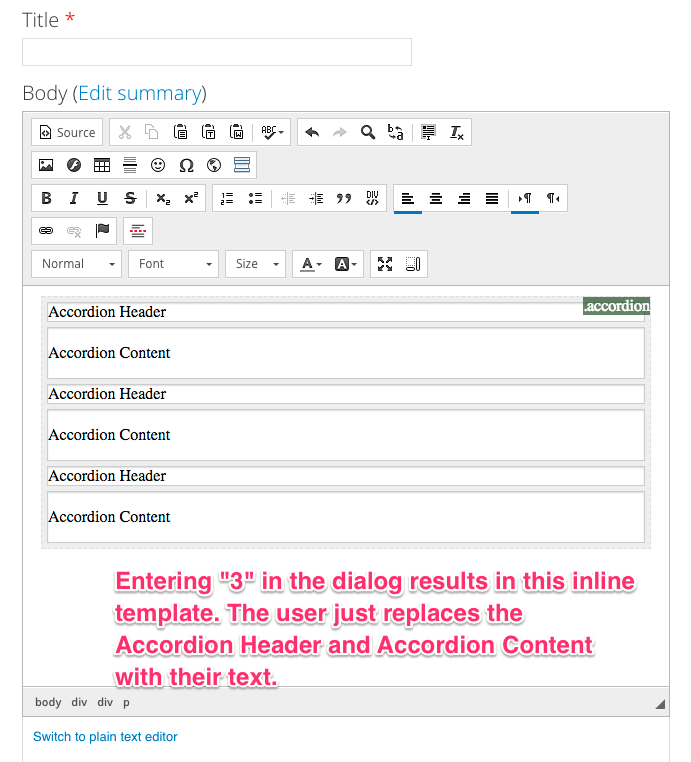 The Accordion Item has 2 fields, Title, and Body. This allows a user to add an Accordion paragraph to a node, then add as many Accordion Items as they want (and be able to sort them in the form). From there, the theming/js is up to you via templates and js, but that part is fairly easy. Since Paragraphs are based on fields, it's intuitive for the editor who use used to the node edit interface. You could look into Views Accordion. It will take the results and display them as a JQuery accordion, using the first field as the header for the accordion rows. If you add the required fields to the node and allow users to edit those. The changes should be reflected in the view automatically. This module extends the Field Group module by adding the ability to override the default title of a field group item (horizontal and vertical tabs, accordions, divs and fieldsets) on a per node basis. The use case that prompted this module included 15 nodes of the exact same format with different tab titles, and it had to be easy for editors. Using Quicktabs for this case would have required each tab to be a separate node, and each instance would have been rendered as a block. So in the above example you end up with 6 nodes and 2 blocks, as opposed to just 2 nodes. Field Groups by itself would require a unique content type for every node where the group's label changes. This module allowed me to add 15 nodes with unique tabs on each using a single content type. Sounds like something that could fit your needs as well. What approach for showing custom user fields on a node? How do I create a Machine Name type of field? How to make profile fields based on conditional role selection before account creation? How to group fields in the form without grouping them in the node view? How to update block with step links based on AJAXified multipage entity form state?